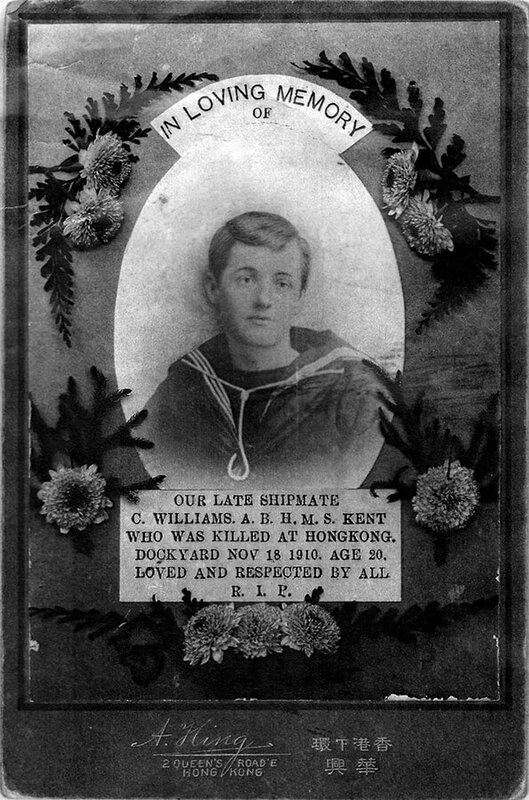 HF: While on holiday recently in Aberystwyth, Wales, UK, I came across this memorial photograph of Able Seaman, C Williams. The ‘Hongkong Dockyard’ could refer to either of the two large shipyards in 1910, Taikoo, or HK and Whampoa. However the latter was more usually known as Kowloon Docks so I am guessing AB Williams died at Taikoo on HK Island. Or given the Royal Navy connection, HMS Tamar which was its base in Hong Kong, though I think the term HK Dockyard was less likely to have been used in connection with this yard. It would be interesting to know more about this young man and how he came to die so tragically young in Hong Kong. A copy of the image below was given to me at the Archifdy Ceredigion Archives in Aberystwyth by the very helpful, Helen Palmer, County Archivist. (Archives number WJL/2/9/3/16.) It was the only item they had linking the county of Ceredigion and Hong Kong.